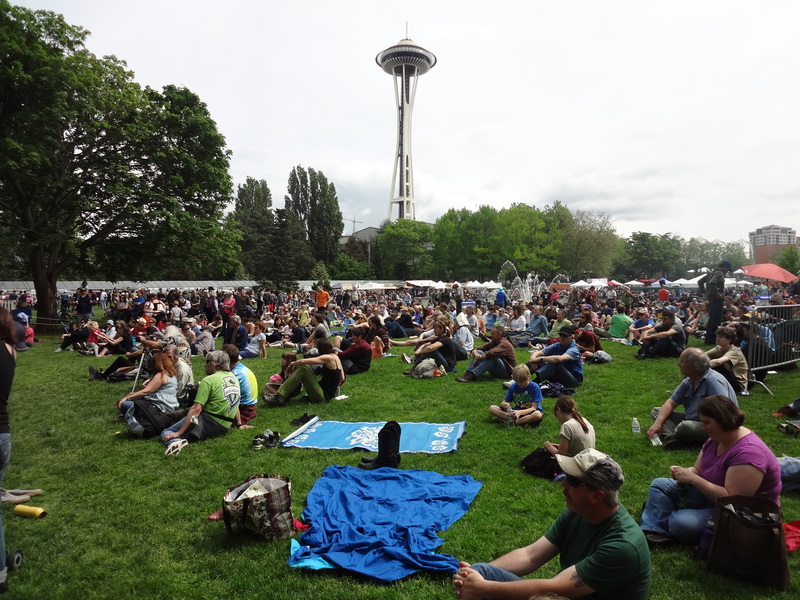 It’s springtime in Seattle, Memorial Day weekend, and that means Folklife Festival at the Space Needle. This celebration of acoustic music and art is a Northwest favorite featuring artists and musicians from the Pacific Northwest. There’s polished bluegrass bands, dreadlocked street buskers, artisans selling counter culture specialties, Jesus freaks, magicians, all set outdoors in the Seattle Center grounds with six outdoors stages on the green for the professionals and the sidewalks open to anyone with a banjo, washboard or bagpipes to play on (with permission from the Folkilfe administration). The atmosphere is happy, celebratory, reminiscent of bygone hippy days with wafts of marijuana smoke drifting by, body painted kids playing in the fountains, drumming circles, contra dancing and music – music everywhere – and it’s all good. Our favorites are the street bands; the buskers. Some are hastily assembled groups playing 1930’s boogey woogie on an eclectic array of instruments from tubas to steel guitars. Others are polished bluegrass or country rock groups that play regularly in local bars and clubs. This year it rained of course, so we watched the weather forecast and picked a relative dry Saturday. We chose well and armed with a backpack full of water and beach blankets we spent the day wandering through the various alleyways, grassy stage grounds and pavilions. Some bands had the crowd dancing in the street – others captivated the audience with haunting ballads. Almost all played a blend of their own music and old timey tunes to produce and sound that is so quintessentially Northwest. Folklife 2014 is over now, but other typically Northwest festivals are coming – The Fremont Street Fair, Rain Fest, Quileuete Nation Days, Oregon Country Fair, the Omak Stampede, the Logger’s Jubilee – and we’re going to try to hit them all.